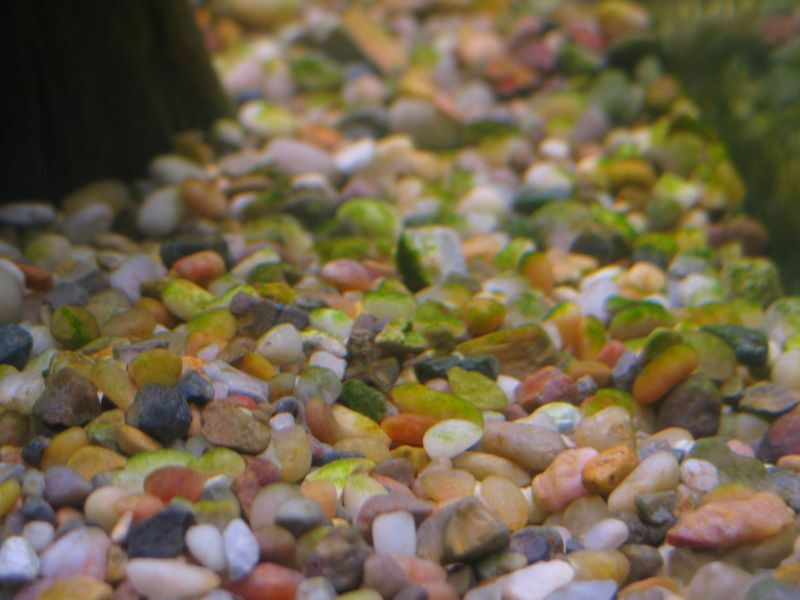 Silica, also known as brown or gravel algae, begins as brown patches on the gravel and/or glass, then rapidly coats most surfaces of the aquarium with a thin, dark brown coating that is easily removed. Unlike blue-green/slime algae, it does not come off in large slimy sheets. Silica/Brown/Gravel algae is a common occurrence in a newly set up aquarium. It is generally caused by too little light, an excess of silicates, an abundance of nutrients, and too little oxygen. Silicates can build up through tap water that is high in silicic acid, and silicates that leech from some types of substrates. This type of algae does not adhere strongly to the tank surfaces and is easily wiped away. Vacuuming the gravel with a siphon will quickly remove coatings from the substrate. Increasing the lighting will inhibit regrowth of brown algae. As a new tank matures brown algae is often eliminated naturally by plants and green algae competing for nutrients. Some suckermouth catfish will readily eat brown algae, most notably plecostomus and otocinclus. If the problem is due to high silicates in the water, and the brown algae persist, a special silicate absorbing resin can be used in the filter. As with any algae, keeping the tank clean and performing regular water changes is one of the best preventative measures. Unfortunately, it is still possible to get algae in spite of regular maintenance, especially in a newly established aquarium. Prompt attention to sudden algae growth will prevent more serious problems.